The annual Puppy Bowl program on Animal Planet is back with their 15th season, airing on Feb. 3 2019. This Super Bowl Sunday special has a lineup of 93 adoptable puppies, including 3 special needs dogs, from 51 shelters across the United States, Costa Rica, and Puerto Rico that are ready to chow down on the upcoming game. The Puppy Bowl originally aired in February 2005 as a joke between Animal Planet executives to counterprogram the Super Bowl. Despite being a joke, its first airing racked up a total 5.8 million viewers and has continued to grow since. It has also become sponsored by brands such as Petco, Pedigree, and Arm & Hammer Slide cat litter. As these loveable champions are puppies, there aren’t strict rules when it comes to the game. There are two teams, Team Fluff and Team Ruff, both designated by the scarf the dog wears. If a puppy manages to bring a toy through either goal line, then it’s a point for their team. The team with the most points wins the game. However, the Puppy Bowl has a ruff-eree, Dan Schachner, who calls out touchdowns and any inter-fur-ences. Despite having lax game rules, choosing contestants has ruff guidelines. Puppies must be between 12-21 weeks old, well-socialized, and have all vaccinations. They also must be under a certain weight, so they don’t break the field. This adorable program, however, is filmed months in advance with around 17 cameras in about 2 days. This filming process is due to the players. Puppies are untrained and unpredictable balls of fluff. The staff has no idea if they will get any exciting footage; plus, rotating teams of puppies add to the time it takes to shoot. The film then has to be cut down to the best, cutest, and most action-filled moments before it can air. As the Puppy Bowl is filmed months in advance, most of the fluffy stars have been adopted by the time the show airs because the pups are publicized on the Animal Planet website. Any remaining pup is typically adopted during the programs showing. However, if someone was too late and the puppy they were hoping to buy was already adopted, the puppy profiles on AnimalPlanet.com connects to the shelter the puppy came from. This encourages the adopter to look for other similar animals they can adopt. Puppies are not all that’s adoptable during the Puppy Bowl, but almost any animal on screen is adoptable. The Puppy Bowl has also added little flourishes over the years such as the Kitten Half-Time Show, which the cheerleaders have rotated through many different species such as bunnies, guinea pigs, and chickens. They have also added the bird-commentator named Meep, who live tweets about the game, and the mini-blimp piloted by a hamster. At the end of the game, the winning team takes home wagging rights and the newly added “Lombarky Trophy” which is a large Petco-brand dog toy. They also crown one dog the MVP (Most Valued Pup) based on online voters. 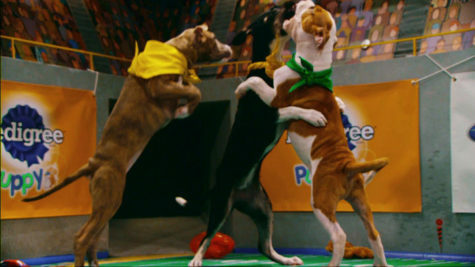 The Puppy Bowl has also expanded to include a pre-game show to catch up with past competitors as well as see an inside look at the puppy locker rooms. The Puppy Bowl also lead to the creation of the Dog Bowl last year, which stars Team Oldie and Team Goldie made up of dogs ages 2-16 that are ready for adoption.